This masterpiece bulletin board dates back to May 1994 when my family moved into the house where my parents still live. We had just moved back to Canada after being in Australia for a couple of years. I was finishing Grade 10. 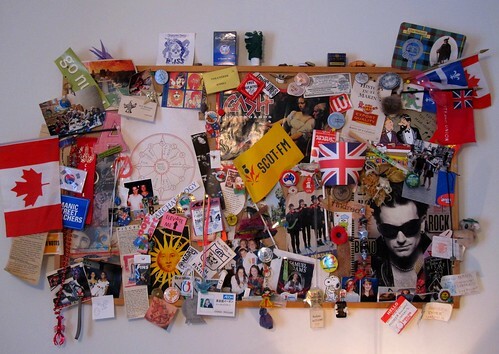 The pin board collage in my bedroom would have started off with some photos of friends, Bono's cover from Rolling Stone, and a few images torn out of surfing magazines. By and by, the thing grew as I pinned pins, stuck stickers and posted postcards. Everything that caught my eye went up there. 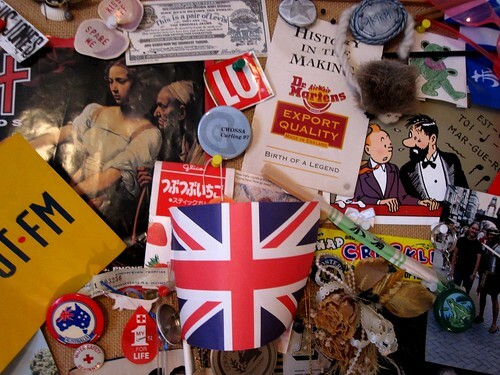 When I left my high school bedroom behind to go to university and later to move overseas, the board stayed up. I didn't add much to it after 1997. There's a Korean flag patch from a holiday in 2002, my ID badge from my job in Japan, a souvenir from a Kendo tournament... everything else is reflective of my teenage tastes. I dismantled the entire thing this weekend. 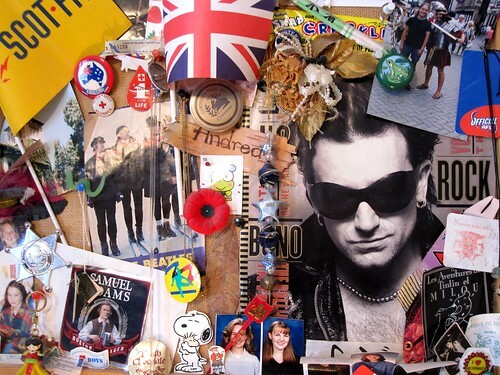 I recycled the bits of paper, stashed the photos and Bono cover in a scrapbook, collected the pins and keychains in a drawer and binned the junk. The board was no longer a representation of my interests and experiences, it had become no more than an eye-sore and a dust collector. Now, the whole room looks tidy, not chaotic. Every now and then, I have moments when I want to simplify and reduce the number of items around me. I think it's a good for me to cultivate this lack of attachment to possessions whenever possible. Oh NO!! You dismantled it? Why would you do that? You should have left it as is to show your kids!